There are many ways you can add life and color to a garden; a neatly tendered flower bed with beautiful perennials, contrasting with a wild flower area that attracts a wide variety of insects, butterflies and more is a great way of enhancing the look and feel of the garden. You can attract birds of all varieties by providing food and shelter for them; if you hang bird houses, you may be lucky enough to see breeding pairs living in your garden and enjoy watching them bring up their young – a truly enlightening experience. Trees and shrubs also provide adequate nesting areas for birds, and you can find many spots in even the smallest of gardens for flowering shrubs that provide plenty of color and variety. However, we want to talk about another attractive asset you can add to your garden – a pond. You may not have thought of a water feature such as this – perhaps you consider it to be an expensive option – but a pond really is a great way of adding something special to your garden, no matter the size of the space you have. The first thing to consider is where you are going to put your pond. It is advisable not to site it too close to a tree, as the falling leaves may cause problems, so look for an open space where you can get the best from your pond, and think about exactly what you want. There are many ponds available commercially, and it is sensible to look at these as the basis. You can also find waterfalls and other features, such as very attractive fountains, that add movement to the pond, and are well worth checking out. A pond needs fish, of course, and you can buy a wide range of different species that will thrive in a garden pond, so the humble yet beautiful goldfish is not alone! Your fish will be happier in well aerated water, so you should also look at buying a pond pump which will keep the water clean and healthy, so check out the latest pond pump reviews. Once you have an idea of the design and additional features you want, you can set about finding the right pond and equipment for your garden. Your pond will soon start attracting a wide variety of fresh wildlife, which will add colour and movement to the garden. Beautiful insects such as dragonflies and damselflies – amazingly colourful creatures that flit about in a magnificently charming fashion – plus amphibians such as frogs and toads will find your new pond an attractive feature, and they are all fascinating to watch. 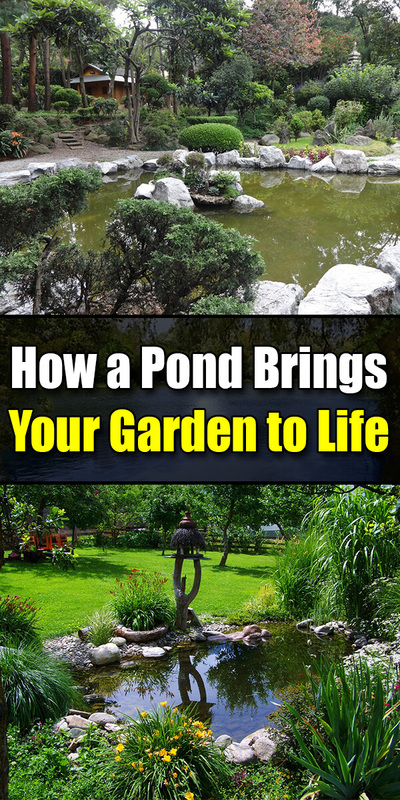 A pond brings a garden to life in more ways than you can imagine, and is a great talking point. Have a look at the many available water plants, too, as these are the final touch that can make your new pond the talking point it will become, and bring even more color to your garden.